A vast open-plan kitchen/living/dining area traverses the entire front of the house, with amazing lake views. The kitchen has brand-new, top-of-the-range equipment, granite worktops and island unit. Sliding doors open onto the terrace with spectacular lake views and a bar and BBQ to enjoy your sundowners. A TV den with home-cinema, a back kitchen/utility room (with second and WC complete this floor. Upstairs there are 5 bedrooms, of which 3 have stunning lake views. The master bedroom has an en-suite bathroom with a bath overlooking the lake. 3 of the other bedrooms have showers. There is also a shared bathroom and WC on this floor. The attic has two single beds and a Games Area. The large enclosed garden with swingset is perfect for kids. The first, second and attic floor of the house are yours. The Garden Flat is rented separately (but please feel free to inquire if you wish to rent both properties). together). 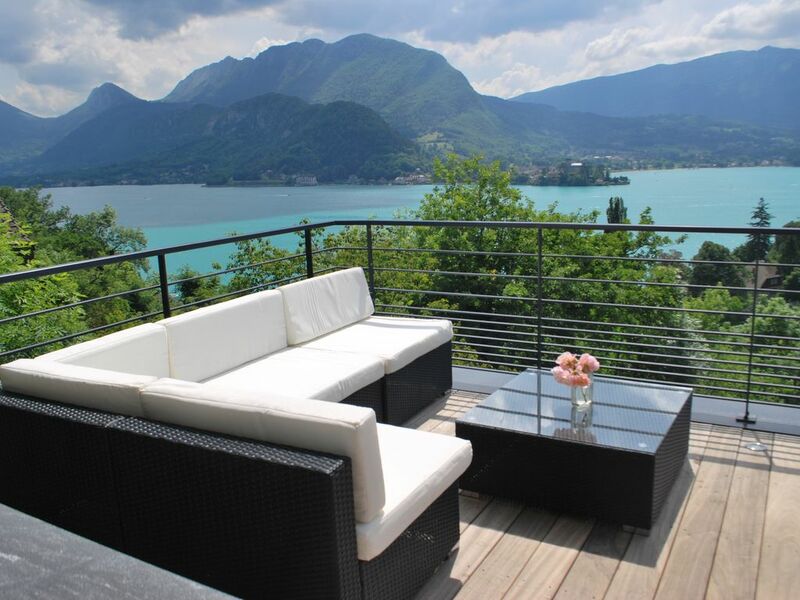 Architect-designed and beautifully renovated to the highest standards, this stunning chalet overlooks Lake Annecy. There are two Units - the Garden Flat (sleeps 4) which is available year-round and the Luxury Villa (slepps 10) which is available certain weeks of the summer. When looking at the photos please click on the photo to read the title as this will tell you if it is a photo of the Garden Flat or the Luxury Villa. We have chosen a modern, light, Scandinavian feel with huge windows and terraces overlooking the lake to make the most of the spectacular views. White walls, muted colours, oak floors and polished concrete create a minimalist yet cosy interior. If you have a large group (14-16 people) and would like to rent the Villa and Garden Flat together in July or August 2019, please contact us. Please note that while the two properties share a driveway, they have separate entrances and terraces, and have been carefully designed with both parties' privacy in mind. Le Ban de la Roche is two minutes walk from the centre of the village and Lake Annecy. Talloires is a typical little French village with a lot of character! It's a paradise for nature, sports and food lovers. Set on the lake but with woods and mountains just behind, it offers a huge range of exciting activities including water-sports, paragliding, canyoning, hiking, mountain-biking, road-biking. A 42 km cycle path goes around the entire lake. Talloires beach is a great spot to relax and enjoy the lake. Kids love the paddling pool, slide into the lake, children's pool, diving board and swimming platform. A range of restaurants will keep you entertained in the evening from the Savoyarde on the beach with its amazing views and delicious pizzas, to ultimate gourmet and romantic dining experiences at Michelin-starred chef Jean Sulpice’s Auberge de Pere Bise and the more traditional Hotel de l’Abbaye. Talloires is 14km from the beautiful medieval town of Annecy, known as the Venice of the Alps. Annecy has a direct rail link to Paris. Buses, boats and water-taxis link Annecy to Talloires. Talloires is 45 minutes from Geneva airport. We are an English couple with 3 girls aged 11-6. We have been living in France for 17 years. We moved to the Annecy area 8 years ago and love it - especially the lake in the Summer and skiing in Winter. It's a great base for exploring the Alps and offers so many outdoors activities for children. We were looking for a house in the Lake Annecy area that was walking distance from a village as we did not want to have to get in the car every time we needed to go somewhere. This house was perfect as it is within walking distance of the lake, the children's school and the centre of the village. We love the views of the lake and mountains from the house. The view changes constantly throughout the day depending on the weather and never fails to take our breath away. We also love the privacy and peace offered by the large enclosed garden. Talloires is 40 minutes from the well-known French resorts of La Clusaz and Le Grand Bornard. Both have plenty of runs for beginners and intermediate skiers, as well as fantastic off-piste for experienced skiers. Spas, swimming pools, sledging, ice-skating, snow-shoeing and sleigh-riding for non-skiers. Talloires is 15 minutes from Montmin and 30 minutes from La Sambuy - both ideal small resorts for beginners and learner children. Talloires 18-hole golf course is 2km away, and another 18-hole course is 11km away at Giez. The property itself is a gem. It is represented very well in the photos. You never have to leave should you wish to enjoy Talloires and the house. Views are stunning, walking to boulangerie and restaurants. The public beach is about 5 minutes walk. There is also a free beach that is a slightly smaller walk. It is very well suited for a family and kids. Ours ranged in age from 20 months to 16. Felicity and Kelly (property manager) were great to work with even when we had some challenges (not of their doing). Overall a very pleasant vacation and we’d definitely would return. Thank you Rachael. We are delighted you enjoyed your stay and hope to see you again in Talloires one day! We took older children (10, 14, 17 and 25 year olds) to this house and it worked perfectly. The house and garden are large and the terrace with lake views perfect day or night. The youngsters enjoyed being able to walk down to Talloires beach with its day and evening activities. You need a car and we took bikes and a boat for a very active week but you can also hire these things. The house is clean and comfortable with all the amenities you would expect. We liked the fact that it is a recent acquisition and the decor is old fashioned. We found it a relaxing place to be and would definitely return. Thanks for taking the time to review our house. We are delighted that you had a good time. Yes, the "vintage" wallpaper is quite a talking point with all our visitors - but we have grown to love it! We are currently renovating the ground floor of the house and as of January 2014 we will have a 2-bedroom garden flat to rent, available either with the main house or separately. Très belle maison , très confortable, avec vue incroyable sur le lac. Les commerces et la plage sont accessibles à pied. Nous serions volontiers restés une semaine de plus! Merci Pascale. Nous sommes contents que vous avez passé un bon séjour! Talloires is a paradise for hikers - with spectacular waterfalls, woods, meadows and mountains all within walking distance. Explore on your own with our detailed local walks guide, or let us organise a guided Alpine walking week for you. Local guide Adam Horler caters for all levels, from those wanting to conquer their first col, to experienced cyclists wanting daylong multi-mountain rides or guided weeks. Silas Cullen, renowned NZ triathlon coach, is available for cycling technique workshop and bike setup. Training for a race? Let our team of local experts build you a tailor-made programme of local trails, off road run technique workshops, early morning boot camps at the beach, rounded off with a sports massage to recover! If relaxation is more your thing, we can organise a mindful week of meditation, yoga and massage for you. Ann Horler lives in Talloires and is a trained fitness instructor and yoga teacher. We are 3 minutes walk from Lake Annecy. Talloires beach has a paddling pool for babies and toddlers as well as a slide, diving board and swimming platform for older children. Life guards operate at the beach. Pedalo and boat hire is available in the village. There is a beach bar offering drinks and food throughout the day and evening. Geneva airport is 40km away. Annecy train station (direct trains from Paris and Lyon) is 15km away. Chambery airport is 60 minutes away, Lyon 1h30. Car-free holidays are possible. We are happy to advise on activities within walking distance and local public transport. La Clusaz - 27 km. A short walk away, Talloires beach is ideal for relaxing and taking in the amazing views. The cleanest lake in Europe, people generally swim in it from May until September/October (wet suit required the rest of the year!). The village itself is very picturesque, with a small supermarket, local produce market in the Summer and sprinkling of craft shops. It has a range of restaurants including the Michelin-starred Auberge du Pere Bise, an authentic brasserie in the village and a good value pizza restaurant on the beach. Lake Annecy offers most water-sports, from water-skiing to wake-boarding and paddle-boarding. You can also hire sailing and motor boats, pedalos and kayaks. Next to the mini-golf, the local bike hire shop rents road and mountain bikes. Visitors can cycle all the way round the lake (takes 2-3 hours) or tackle some of the local cols. Children's bikes, bike seats and tandems are available. Talloires also has a tennis court, available for hire by the hour. Talloires is famous for paragliding. Beginners can do a tandem jump with an instructor. If you want yet more adrenaline, you can also try canyoning and scuba-diving. 40 minutes from the Alpine ski resorts of La Clusaz and 1h30 from Chamonix, Talloires is also a great location for mountain-lovers. Footpaths behind the house lead all the way up to the top of La Tournette, the highest mountain around Lake Annecy. In the Summer a ferry takes you across the lake into Annecy (also known as the Venice of the Alps). Very pretty, Annecy has museums, great restaurants and many independent shops. We live in the main house 11 months of the year and are happy to advise on activities and local attractions. However, we are also very good at keeping our distance if you just want to take it easy and work things out yourself. If you have young children and would like to go out to dinner in the evening, we are happy to listen to a baby monitor or organise a local babysitter for you. Booking Notes: Please contact owner. Changeover Day: Saturday. Notes on prices: Please note that the flat is available year-round. The house is only available in the Summer.